This connective process began in April, 2009 at the National Conference on Cast Iron Art at SLOSS Furnaces in Birmingham, Alabama. Foundry Tree is an evolving, changing project. Over 600 participants to date are part of this database! This connective process of began April 1-4, 2009 at the National Conference on Cast Iron Artat SLOSS Furnaces in Birmingham, Alabama. Please e-mail me at gabriel.akagawa@gmail.com if you have questions, are interested in participating in, hosting, or exhibiting this project. Due to limitations of technology, the main tree only represents a select few of the artists in various iron casting communities. If you have had your picture taken for this project, you may be linked to this project via a colleague on the treeor through an institution, community or event listed at the left of the site.You may also search for your last name via the Search function at the upper left. “FOUNDRY TREE WAS AT:” is a new feature to the Foundry Tree at the bottom of the site. These posts give a backdrop to each event that hosted the Foundry Tree project. A special video work by Laura Mullen is featured on the WCIAA in Granite City, IL 2018 post. Please e-mail me at gabriel.akagawa@gmail.com if you have questions, are interested in participating in, hosting, or exhibiting this project. You may also email me your digital image to add to the site. Due to limitations of the website, the “tree“ only represents a few of the artists in various iron casting communities from the first years of the website. The more comprehensive displays are the Schools, Institutions, Events and Pours table and Iron USA Map and Iron Earth Map in the menu at the top of the site. 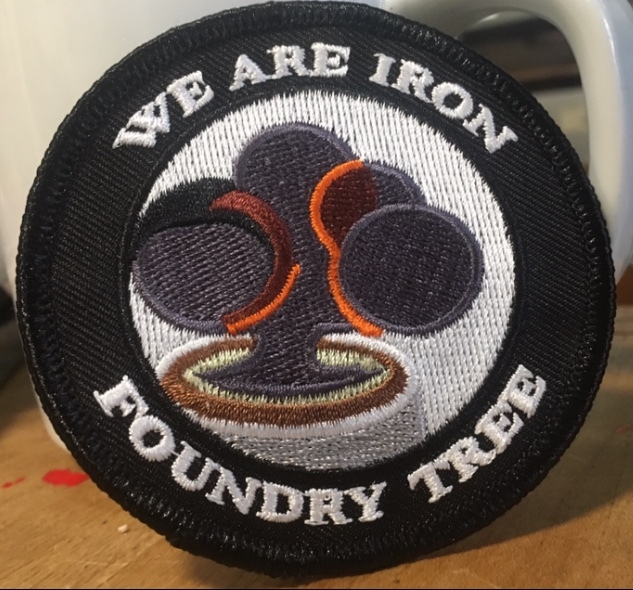 This 3 inch sew-on patch will be available at the 2019 NCCCIAP commemorating the 10 year anniversary of the Foundry Tree.